This trip I’ve been to Clarke Quay already three times and everytime it gives me a different vibe. It’s strange this area by the Singapore River but I like it and am at the same time impressed by it. The first time I went there this trip was on a group tour to take the “Bumboat.” I’ve been to Singapore so many times but never took the bumboat and so I decided to join it this trip. I enjoy being the tourist no matter how “touristy” it is and I especially enjoy anything to do with water and rivers. It’s so calming and relaxing. We get there at around 9.30am and Clarke Quay resembles a deserted town. All the shops and restaurants are shut and not a single soul is to be seen. It’s quiet. This part of Singapore has not yet awakened. Only after nearing the crossing roads do we spot a few people. They are runners out for their morning jog. Healthy people. It’s quite educational this trip. I learn that this beautiful area where the shops are painted in different colours and there are outdoor seatings by the singapore river was once the “Stinking sewer” of Singapore. After the advent of large containers, the bumboats that used to bring goods back and forth to Singapore were abandoned as were the trading houses and warehouses along this river. People disregarded the river and everything you shouldn’t throw into the river was thrown there. It stank and it was polluted. Then in 1977 the Prime Minister Lee Kuan Yew was said to utter the words “Clean it up.” It took ten years for the government to clean out this stinking sewer and today its waters are quite clean and it has become a popular place for all to hang out in the evenings. It gets crazily crowded. What amazes me though is that this area is also part of the Singapore reservoir and that the long term goal is to make the water drinkable. Imagine that. Even the bumboats are now operated by batteries so that they don’t pollute the water. And so in the morning, I am riding down the singapore river in a bumboat with the breeze in my hair. 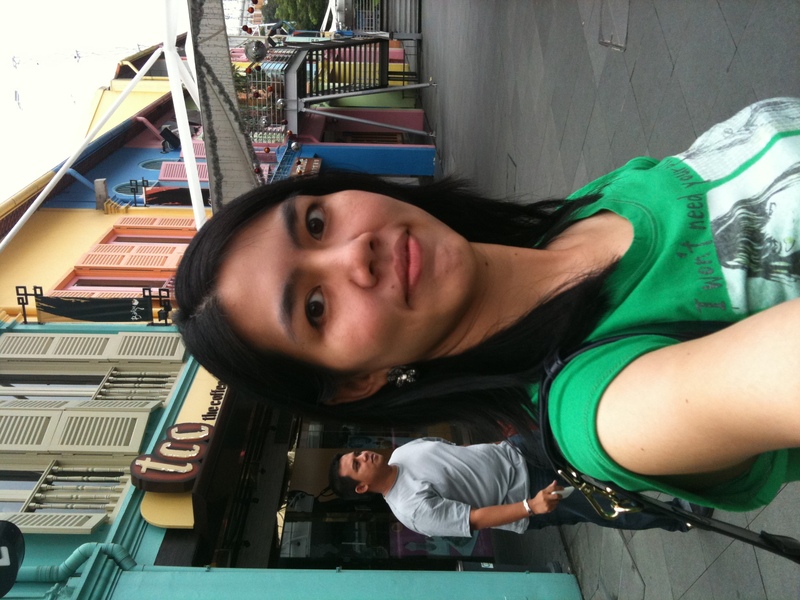 I pass by Clarke Quay, Boat Quay, the Merlion and then out to Marina Bay. I see a beautiful view of the Marina Bay Sands and hundreds of white balls filled with New Year Wishes of Singaporeans. It’s relaxing and a great overview to the main sites along the waterway in Singapore. I return later that Saturday evening to meet wonderful friends who take me out to enjoy the famous pepper and chilli crab at Jumbo Seafood. It’s mouthwatering and I eat more than I should. Food in Singapore is always good and even better when you are with good friends. We walk around after dinner and the hoards of people are overwhelming. There are people everywhere, I hear a couple languages being spoken. There is a brazillian bar that lures guests with some brazilian dancing. Guys stop dead in their tracks to watch blocking the passageway. I wonder if the gimmick works and people actually go in to order food. Then there’s a bar that resembles a clinic. Guests sit in wheelchairs and drink out of hanging blood bags. It’s a bit too much for me. At almost midnight, Clarke Quay is still humming full of life on a Saturday evening. My third visit to Clarke Quay was Sunday evening just before the sunset. It was not crowded, the shops were open and it was just lovely to walk along the Quay with my cousin. I love having relaxing strolls. If only Alex was here it would be great. I go have dinner at the Hot Stones restaurant which allows you to cook your own steak on literally hot stones. Its fun. The steak stays juicy and delicious. I make a mental note to buy myself a stone for cooking at home one day….. There is a certain charm to Clarke Quay. It’s a mixture of history with modern day life. Who would imagine 100 years ago that these trading houses and warehouses would one day be converted into restaurants and bars? Next ›Fitness fashion: Did you know?